We’re finally going to have the baby,” shouted an excited Malini Vachani-Akerkar into the telephone while her husband, who was in New York on an assignment working with Michael Romano, chef of the Union Square Café, sat and listened in stunned silence. It was 1998. “I thought she wasn’t due for at least a few more months,” he stuttered. “Are you sure? What does the doctor say?” And that’s how Rahul Akerkar, co-owner of one of the most successful and popular restaurants in India found out that the ‘birth’ Malini was exulting about was actually the new home of their second ‘baby,’ Indigo. But, unlike all normal deliveries, this one did not begin nine months prior to its birth. Could this new kind of cuisine be palatable to the average Mumbaiker? “In fact, I remember Camelia Punjabi (of Taj Hotel fame), telling us during our soft opening that Indigo was a gutsy move, but would it work? And she wasn’t the only nay-sayer and doomsday caller,” says Malini. Yet here it is, nine years later an exuberant young adult having grown from an infant with teething problems; its popularity, success and consistency continuing to build. And given the fickle nature of Mumbai’s diner today who has travelled the world, been exposed to global cuisine, and demands the best, what really was its secret formula? Then maybe it was all about the right vastu and feng shui to which Rahul laughingly shared how in Indigo’s infant years a customer called him over, complimented him on his food, but very seriously admonished him on how placing the kitchen in the North was very bad vastu, and would lead to the premature demise of the restaurant! Dig a little deeper and one discovers it is the old-world charm that exudes from the sensitively restored bungalow; it is the conscious thought behind preserving the dying tradition of araish work on the restaurant’s walls; it is Malini’s keen eye and attention to detail that has created the timeless décor; it is the steadfast and firm belief in the often misunderstood concept of great service and treating all customers with respect irrespective of status; it is the dedication of the kitchen to continuously create magic and it is the wonderful guiding principle of ‘having a good time doing what you love doing’. “Why Indigo never fails to excite and thrill me,” Rahul tells me suddenly, “is seeing the pure expression of joy and happiness on a customer’s face who is surprised by finding an actual pearl in her oyster.” To which Malini added how when Indigo first opened, a group of 10 came to Indigo and had to wait a while before getting their table. Not pleased at having to wait, as well as being accommodated in what is today known as the Black Lounge, they were rendered speechless when the restaurant paid for their entire meal in recognition of its breach of promise to honour a reservation. It is not surprising then that in its nine years of gracing the city, Indigo has provided for many a memorable experience. But the one that, for me, epitomises Indigo’s heart and soul is the touching story of a customer who had always wanted to come to dine at Indigo but could not due to severe dietary restrictions and illness. Upon hearing this, Chef Nitin personally created a special menu for her so she could enjoy her meal at the restaurant. A month later, the restaurant got a call from her husband to inform them his wife had passed on but that she never forgot her special meal. 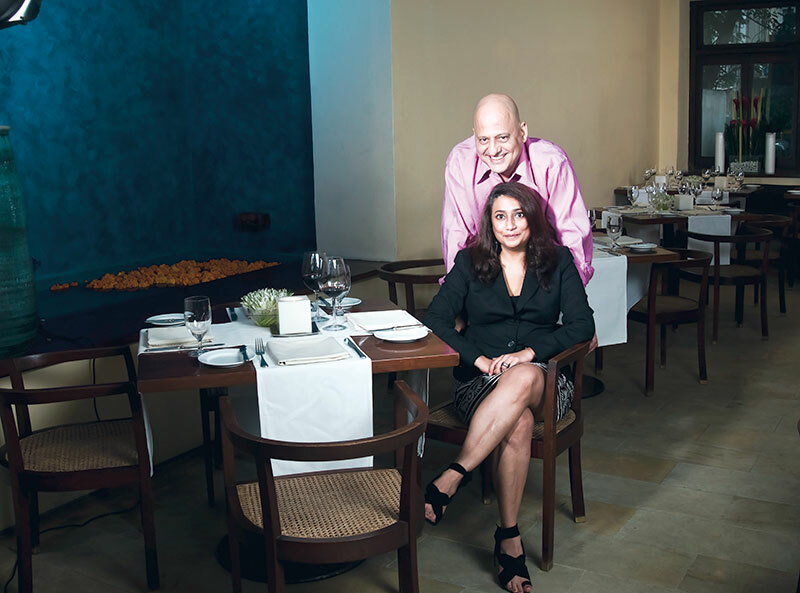 I finally had to ask both Rahul and Malini, what kept them going both as a couple and as restaurateurs. “I think it’s the love for food, continuously evaluating yourself and….” But Rahul was quickly interrupted by Malini who said, “our passion, commitment to excellence and penchant for punishment is what keeps us going.” Listening to her finish Rahul’s sentence I realised that it was this simple act that was the key to their success: the complete faith and trust in each other that overflows into everything they do.